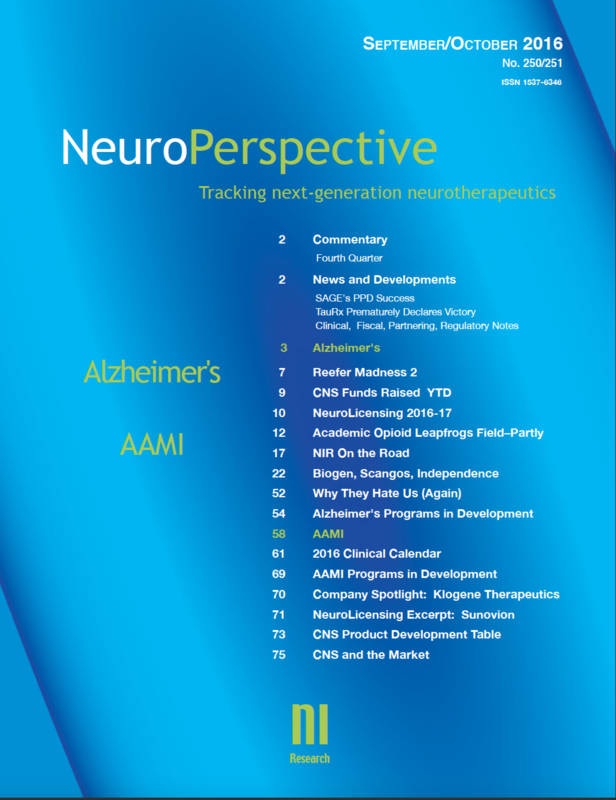 The November/December issue of NeuroPerspective features a comprehensive review of the Pain space, divided into two major sub-sections, Nociceptive (including Inflammatory) Pain and Neuropathic Pain. Even as attention has necessarily been focused upon the Opioid Epidemic that had its roots in an overreliance upon prescription opioid analgesics, the Pain field has yet to develop non-opioid alternatives that provide sufficient analgesia for severe pain. Some companies have focused upon developing modestly-less-abuse-prone opioid reformulations, these have failed to impress regulators or prescribers. Trevena‘s ‘biased agonists’ represented an unacceptable trade-off of efficacy for safety, while NGF antibodies have had a torturous path through clinical and regulatory challenges, and are burdened by their own safety risks. Extending the range of short-acting anesthetics in order to circumvent the need for post-operative opioids is a strategy that has shown some promise. Neuropathic pain is in some ways even more ephemeral and frustrating, there has yet to be a ‘gold standard’ for neuropathic pain, which comes in several major sub-varieties, and for which current treatments tend to offer only partial relief to a minority of patients. Among the 60+ programs are assessed are those from: Centrexion, Lilly/AstraZeneca, Teva/Regeneron, Trevena, Vertex, Cara Therapeutics, Wex Pharmaceuticals, Mesoblast, Adynnx, Recro, Novartis/Spinifex, Xenon, Astraea, Coda Therapeutics, Aptinyx, and Amgen. The Boehringer Ingelheim licensing agenda is excerpted from NeuroLicensing 2018-19. Sidebars include coverage and commentary regarding the JNJ esketamine program in depression; competition rapidly pursuing Biogen’s Spinraza, the ambiguity of Eisai/Biogen’s BAN2401 data in Alzheimer’s, and the ADCOM rebuff of Alkermes‘ highly flawed NDA submission for ALKS 5461.